Here’s one I haven’t seen since I was five or six years old. I don’t think I watched Saturday morning cartoons when I was a kid, so the extent of what I know about He-Man comes from Masters of the Universe. I’m pointing this out so I don’t offend the die hard fans out there with my ignorance. For all intents and purposes, I’m an adult who’s just been exposed to the He-Man mythos for the first time. Let’s not pretend this movie was made for people my age. The extremely obvious attempts at comic relief make that perfectly clear. The mighty warrior He-Man (Dolph Lundgren) lives on planet Eternia, home of Castle Grayskull. The castle, which holds a plethora of magic secrets, has just been seized by the villainous Skeletor (Frank Langella) and the commander of his hellish army, a witch named Evil-Lyn (Meg Foster). There the villains have taken “The Sorceress of Grayskull” hostage with the help of a “cosmic key” which rips holes in the space-time continuum. Sooner than later this plot device will conveniently usher the characters to Earth, probably because the producers couldn’t raise enough money to shoot the entire film on the Eternia sets, which I imagine is what we all came for in the first place. It’s on Earth that a duplicate of this cosmic key is lost and He-Man must recover it before Skeletor’s minions do. Joining him are a character named Man-At-Arms, a troll, and a female warrior known as Teela, played by Death Spa’s Chelsea Field. (I’ve always thought Field had an interesting and unusually photogenic look, so I was thrilled to see her in a sort of Red Sonja role even though she’s relegated to keeping lookout in the background of too many scenes.) 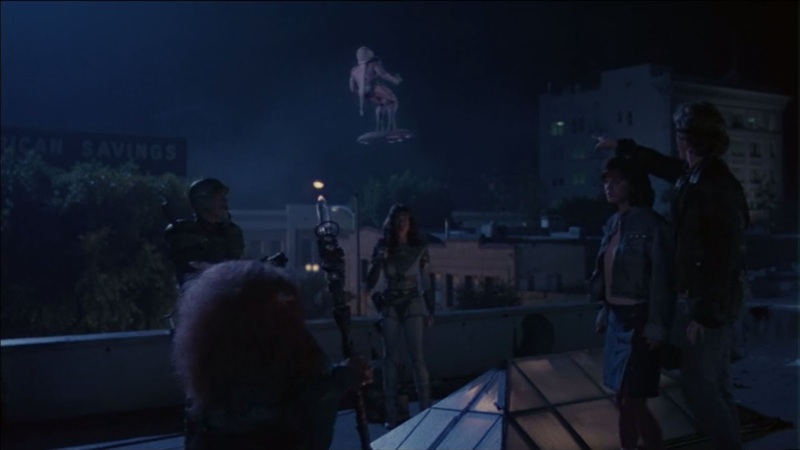 This band of heroes cross paths with the most insignificant characters in the film: a couple of teenagers played by Courtney Cox and TV actor Robert Duncan McNeill. I’m guessing Cox and McNeill’s characters weren’t part of the original He-Man mythos. They feel like an afterthought, added by misguided screenwriting logic: “We should give audience members someone they can relate to!” The film wastes so much time on these sickeningly white bread teenagers it’s a cheat to everyone who came to see swords, sorcery, and cheesy action. 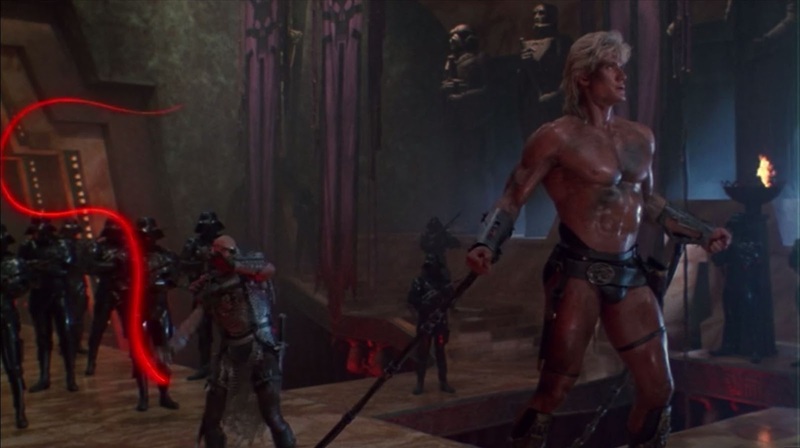 If, like me, you thought Masters of the Universe was going to be set almost entirely in a fantastical world like Flash Gordon, you’re going to be disappointed anyway. Which isn’t to say this is a cheap movie. 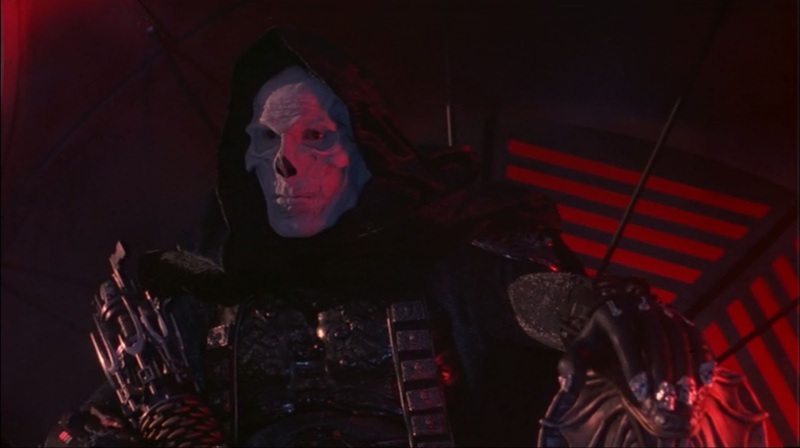 Despite the flaws, Masters of the Universe just isn’t bad enough to warrant a midnight movie-going audience. And despite some wonderful costume creations, it isn’t good enough for adults, either, partly because the villains’ inability to kill anyone plays out at the expense of suspense. The film looks pretty damn good in HD and roughly half of the special FX are kind of impressive, but Frank Langella’s skull makeup restricts his performance rather than enhancing it. If you ever wondered why movie adaptations differ so much from their source materials, Masters of the Universe is the answer. A movie should stand on its own. I suspect MotU’s intended for fans who’ve already explored the rich universe in various media and are already familiar with Man-At-Arms, Teela, and the entirely pointless inclusion of the Sorceress of Grayskull. As an introduction to the He-Man universe, MotU is like walking in on a modern television series midway through. Previous Post Introducing Monday Midnight Movies!